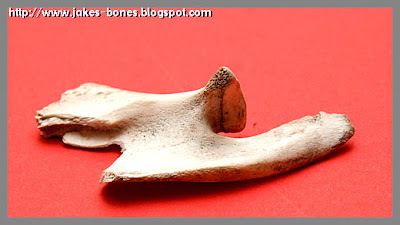 This is about another bone that confused me for a while until we worked out what it was. We were walking through a wood about two miles from my house, looking for bones. The wood was narrow and ran alongside a quiet country road. A few months before, in the same wood, we had found the skeleton of a baby roe deer that had been hit by a car. We hadn't been lucky looking for bones that day, although we saw a dead swan and a live hedgehog. But I found this bit of bone. 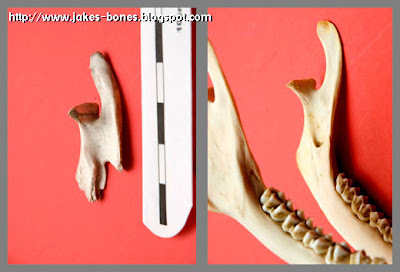 When I first picked it up, I could see it was broken off a bigger piece of bone, and at first I thought it was maybe part of a shoulder blade of a medium sized animal like a roe deer or a sheep, but it didn't match any of the shoulder blades I had already found. It was Daddy who first realised what it was. We had been looking at it the wrong way round. When I turned it the right way round, I could see what it was, and it was so obvious I felt a bit silly. It was part of a roe deer's bottom jaw. Even though I had lots of similar bones, I still hadn't spotted it. It makes me remember that when I find a bone that I haven't seen before, to look at it in lots of different ways to work out what it is. A new sheep skull !